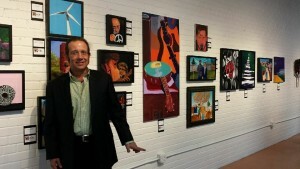 artist, author, producer; making pretty cool art in Austin Texas USA. I like to tell stories with paint, using abstract color to make realistic perspective, light, and shade. i focus on “painting local,” scenes from my own personal experience. 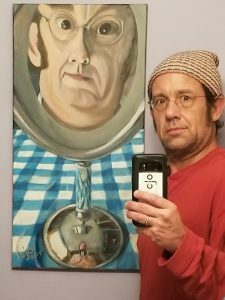 The creator of a website promoting artists, author of a book about creativity, and producer of more than 100 music events, artist Christopher J. Oglesby now creates, promotes and sells his own Pretty Cool Art based in South Austin Texas USA. Christopher J. Oglesby grew up in a world of art, creativity and entertainment. His paternal grandfather was a lithographer and accomplished regional painter & sculptor from Oklahoma while his maternal grandfather was a Tulsa TV & Radio personality, actor, musician, and founder of the Tulsa Spotlighters Club. His parents were educators at Texas Tech University, mother was an English instructor and President of the Lubbock Civic Ballet (Now Ballet Lubbock) and his father Corky Oglesby was a well-known coach, athletic administrator, and radio personality for Texas Tech University. Oglesby was reared in Lubbock Texas and received his Bachelor of Arts and Doctor of Jurisprudence degrees from Texas Tech University. He moved to Austin in 1992 where he pursued a career in law and government administration, including a stint in the Office of the Governor of Texas, and then more than twelve years managing a not-for-profit trust for people with disabilities. 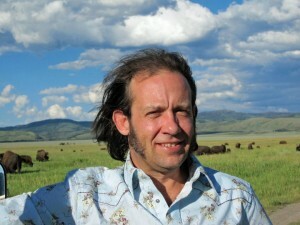 During his spare time, in May 2001, Oglesby created www.virtualubbock.com, a website dedicated to West Texas music, art and culture. In September 2006, the University of Texas Press published his book “Fire in the Water, Earth in the Air: Legends of West Texas Music” (UT Press, 2006), which received the 2007 Certificate of Merit for Research in Recorded Popular Music from the Association for Recorded Sound Collections. Oglesby was a featured author at the 2006 Texas Book Festival. While promoting the book “Fire in the Water, Earth in the Air” Oglesby began producing music shows, featuring many of the artists in the book including Joe Ely, Jimmie Dale Gilmore, Jay Boy Adams, and Bob Livingston of the Lost Gonzo Band. Thus Oglesby became executive producer of Sandstorm Picnic, a series of live music showcases, including a featured showcase for South by Southwest Festival 2009. Then in 2011 Oglesby created & produced South Austin Groovy Sundays, another live music series located at an Austin craft brewery featuring primarily local Austin artists performing original music. Oglesby has produced more than 100 successful music events. He is associate producer and writer of the documentary film “Lubbock Lights” (289 Films, 2005), and is a credited consultant on the documentary film “The Education of Shelby Knox” (InCite Pictures, 2005). He has published articles in popular, literary and academic journals. Oglesby began painting full-time in May 2014, created his brand Pretty Cool Art by cjo in November 2014 and launched this website in April 2015 in order to bring his Pretty Cool Art from Austin Texas USA to the world. Since then, Oglesby has had artwork in juried art festivals, galleries, exhibits, and restaurants across Texas and the Southwest. Oglesby’s artworks are in private collections in Seattle, Los Angeles, New York City, Washington DC, Denver, Colorado Springs, Nashville, Memphis, Lubbock, San Antonio, and Austin.